Success! 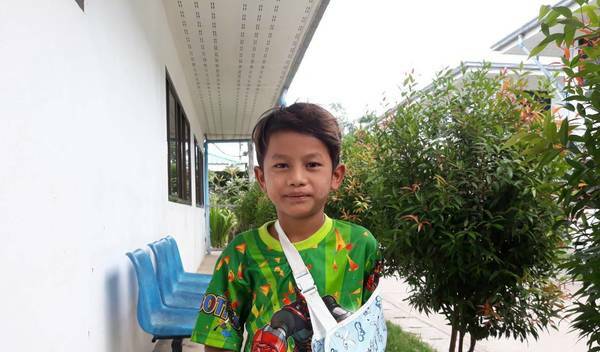 Khant from Thailand raised $1,500 to fund fracture repair surgery. Khant's treatment was fully funded on December 16, 2018. Khant underwent fracture repair surgery. Since Khant received surgery, he looks happier. He he has no more pain in his arm now and he can lift up his hand a little bit. He can even move it around and he feels more comfortable sleeping at night. Khant is a seven-year-old student from Thailand. He lives with his parents in Kyel Di Kho Village, Mae Sot District. Khant loves to play with his friends at school. In early November, Khant was playing with his friends during his school’s lunch break on the swing. As his friends jumped off the swing, Khant fell on the ground and broke his arm. His teacher brought him to a nearby clinic. There, the doctor told his teacher that the two bones in Khant’s lower left arm are fractured. Currently, Khant’s left arm is still in pain, and he cannot move it. With the help of our medical partner, Burma Children Medical Fund, Khant will undergo surgery to reset his fractured bones and ensure proper healing. The procedure is scheduled for November 7 and will cost $1,500. This treatment will help Khant move his hand again without pain. He will be able to return to his school after this treatment. Khant's case was submitted by Bue Wah Say at Burma Children Medical Fund in Thailand. Khant was submitted by Bue Wah Say, Project Officer at Burma Children Medical Fund, our medical partner in Thailand. Khant received treatment at Mae Sot General Hospital. Medical partners often provide care to patients accepted by Watsi before those patients are fully funded, operating under the guarantee that the cost of care will be paid for by donors. Khant's profile was published to start raising funds. Khant's treatment was successful. Read the update. Khant's treatment was fully funded. The patient has broken bones and experiences pain and swelling. The patient will experience decreased mobility. He or she will not be able to do normal daily activities. Many people in remote areas try to fix broken legs and arms by themselves. They also visit spiritual healers or traditional massagers. Sometimes, broken bones heal in incorrect positions. After a series of x-rays, the doctor decides to perform fracture repair surgery. Healing takes time. When the bones have completely healed, patients will resume their normal activities without pain or swelling. Potential side effects include allergic response, infection, malignancy, and osteoporosis. There are no alternatives. If the broken bones are not fixed, the patient will spend his or her life in pain. Decreased mobility will cause the patient to require help from others. Khoeurth is a cashew and potato farmer from Cambodia. He has four children and seven grandchildren, and enjoys listening to the news on the radio and watching boxing on the television in his free time. Ten years ago, Khoeurth developed a pterygium in his right eye, causing him blurry vision, tearing, and irritation. Pterygiums are non-cancerous growths of the conjunctiva, a mucous layer that lubricates the eye. The growths occur when the conjunctiva is exposed to excessive sun damage and the cells grow abnormally over the pupil. He has difficulty seeing things clearly, recognizing faces, working, and going anywhere outside. When Khoeurth learned about our medical partner, Children's Surgical Centre, he traveled for eight hours seeking treatment. Khoeurth needs a surgical procedure to remove the abnormal conjunctiva from the cornea surface and replace it with a conjunctival graft to prevent recurrence. The total cost of his procedure is $201. This covers medications, supplies, and inpatient care for two days. The procedure is scheduled for April 3. 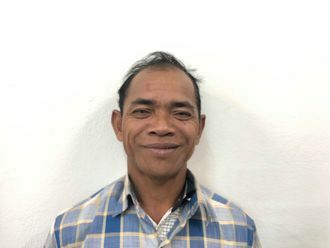 He says, "I hope that my surgery is successful so that I am able to go back to work on the farm and be able to take care of myself independently."